This post is Part 3 of a series to augment the Atlas of the Known World available for free download. Start with Part 1 here. Land of icy crags and broken shale. You voted The Khollek Mountains winner of June 2015 by 52%. 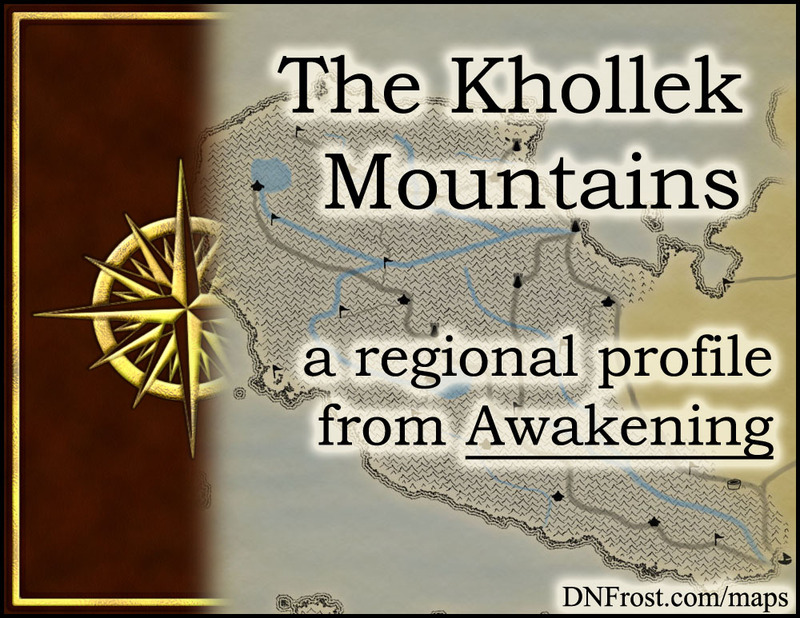 In Chapter 1 of Awakening, the Khollek Mountains cover the western side of the small northern continent of Kholl. The rugged shale mountains are old and crumbling, pulverized by icy polar winds swirling from the northwest. The whole mountain range will someday erode into cold sand. Summers are short but the days grow long. In winter, the dark of night stretches three times as long as daylight, and the spring snowmelt fills a modest network of lakes and rivers. This region also borders the Katei Ocean, Kondak Sea, and Heleki Desert. The crumbling shale of the Khollek Mountains produces a poor soil that cannot sustain much life, and only the hardiest moss and lichen have worked their way over the stone. A few rodents scratch out a living by collecting this moss. Notably, the gardener vole lines its stony nest and tunnels with young moss, tending to its food source and only appearing above ground to seek out new transplants. Seabirds roost on rocky ledges, plucking fish from the northern seas. In the high reaches of the Red Coast, a small colony of wild dragons roosts in the winter before migrating northwest across the sea to their summer breeding grounds on Dragon's Breath Isle. From these wild populations, herds of domesticated racing dragons were bred to be wingless and without magic. The humans of the Khollek Mountains have browned skin and dark hair. They used to be a free people, but they were enslaved by the invading Colkh'rak three centuries ago. Though the desert men to the east were once the same people, now there is an uneasy armistice between the enslaved Kholleks and their rebel Heleki brethren. Though bound to their Colkh'rak masters, the men of the Khollek Mountains enjoy some access to the meager trade that makes its way north from the affluent Kanata. They wear mostly imported clothing of Kanatan style and eat imported produce. Most homes have a pen of domesticated wyverns to supplement their imported diet with fresh meat and dairy. Khollek men are predominantly sensory mages, with excellent flavor magic to enhance their meager diets, and decent light magic as well. They have decent animal magic, much weaker than men of other areas, and their elemental skills are fair at best, though stronger than men of other regions. In general, the enslaved men of the Khollek Mountains practice little magic, aside from their natural talents with flavor magic. The Colkh'rak employ most of their human slaves as menial laborers in the northern quartz mines, but a lucky few are remanded to the kitchens for their superb culinary skills. After three centuries of enslavement, the men of the Khollek Mountains have mostly assimilated into the culture of their Colkh'rak overlords. They care little for the trappings of most modern societies, and instead place importance on hard work and civil obedience. Magic is generally viewed as a privilege reserved for the wealthy elite. Each settlement has its own despot appointed by the Colkh'rak authority, and these local rulers report to the central Barony. To keep their enslaved population in check, the Colkh'rak often divide families, sending children and parents to labor in separate settlements to erode family bonds. Measuring age is not very important for the Khollek people. They gauge the passing of time by the cycle of the seasons, and they generally celebrate the new year on the spring equinox. Children have no official coming-of-age ceremonies, as they usually grow up without a family around them. At first blood, girls are sold as breeding chattel by their Colkh'rak masters, though attractive ones are usually retained for adult entertainment. Boys work into manhood, and the strongest men are used as studs to enhance the laboring population. Obedient men and loyal overseers are rewarded with wives, whose children are distributed to other settlements to prevent the formation of tight-knit communities. The enslaved humans of the Khollek Mountains are forbidden from combat. They may not hunt, make or own weapons, or practice any form of martial art. However, illicit sparring rings impart some experience with hand-to-hand combat, and the men in these fighting brotherhoods often help each other fashion crude weapons out of shale fragments and sharpened wyvern claws. These sparring rings are sworn to secrecy. Not infrequently, the Colkh'rak overlords will root out an illicit group and execute all its members, so each sparring ring stays very small and rarely welcomes new recruits. Khollic is a harsh, sibilant language derived from the tongue of the Colkh'rak overlords. Over the past three centuries, the Colkh'rak language blended with Trophek, the ancestral tongue of the mountain men of Kholl, and the Khollic language emerged. It is written in the spiky runes of the Colkh'rak, though some new runes were invented to represent sounds integrated from the human language. Speakers of Allanic, the unifying tongue of the Known World, cannot understand Khollic at all, and the spoken language has a heavy use of consonants with very few vowels. The language lacks many common gesticulations, which makes communications across the language barrier even more difficult. In the book Awakening, Jorn is a slave for the Barony in the heart of the mountains. His unusual talent as a speaker allows him to communicate with the Barony's racing dragons, which produce a profound income for the Colkh'rak. When Jorn helps a newly arrived slave named Larin hide from their masters, he embroils himself in a conflict of epic proportions. 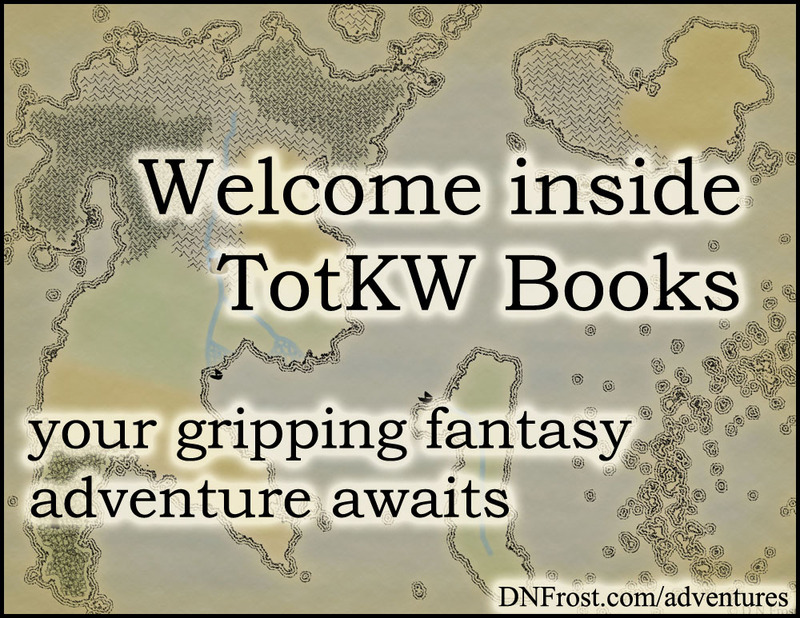 Launched on a journey to the free lands of Allana in the west, Jorn and Larin discover they must help save their precious sanctuary before it too falls to the Colkh'rak overlords.